Sometimes, a film’s title is misleading. Anyone who hadn’t seen a trailer for this film might expect it to be a drama about a car accident or an action movie starring Nicolas Cage or Liam Neeson as they pursue the man who ran down some female family member of theirs. Rather than the conventional “fleeing the scene” definition, this comedy’s title refers to Charlie Bronson (Dax Shepard), a getaway driver in the Witness Protection Program after getting caught and turning in his accomplices, the central character in this excessively nutty film full of nice cars and stupid, selfish people. 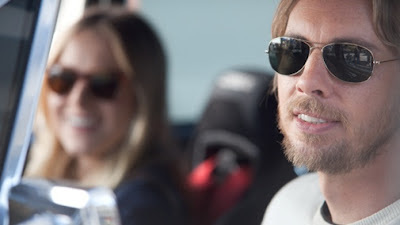 The last collaboration between directors David Palmer and Dax Shepard was the unfortunate Tribeca Film Festival entry from last year, “Brother’s Justice.” Invented stories are clearly better than slightly fictional ones featuring real people playing themselves, and, as a result, “Hit and Run” is a more effective and entertaining flick. As with their last feature, however, it’s clear that bigger is better, and therefore all the characters are loud, obnoxious, and hell-bent on acting crazy, something that, more often than not, proves to be funny and enjoyable. Shepard, who doesn’t vary the roles he plays much aside from his surprisingly heartfelt turn on NBC’s “Parenthood,” has enlisted a diverse and fun cast for this zany adventure. Tom Arnold and Bradley Cooper get the opportunity to go big or go home as an idiotic marshal and a hot-tempered criminal, respectively, and Joy Bryant, Kristin Chenoweth, and Beau Bridges get their own standout moments of comedy. The always wonderful Kristen Bell has had far better parts, and the real standout of the ensemble is Michael Rosenbaum, who proved himself excellent as a recurring guest on FOX’s “Breaking In” after spending seven stoic seasons as Lex Luthor on “Smallville,” as her jealous ex-boyfriend. “Hit and Run” is a decent popcorn movie, but it’s disappointing since the comedic caliber of its cast and the premise could have resulted in a far more consistent and cohesive product. The film peaks halfway through when all of its plotlines begin to come together, and the denouement is hardly as exciting or fulfilling. The film rarely opts for extreme, R-rated humor, which is something that could have helped to enhance its otherwise tempered-down wackiness. Shepard, who penned the film, clearly has a sense of what’s funny, and it would have been great to see a more even and satisfying film emerge from his mind.